There are fruits that are seasonal just like mangoes, lychees and longans. They are cheap and plenty at certain times of the year and it makes sense to buy more of these then. Just like seasonal fruits, a special market vendor whom I call "Uncle" has a supply of goods that are seasonal. I never know what he will bring each week which is great because I like surprises. He has contacts who inform him when shops are closing down for good and he buys goods from these shops quite cheaply in bulk. Some of my purchases from him include a pair of red Benetton shoes , the most charming teapots, pens, Hello Kitty sand art for my children's party, Venetian looking masquerade masks, authentic Hallmark cards, branded toys and just two days ago, buttons. Around $1 for a pack of 100 buttons. And to think I used to buy them from shops in Chinatown or Jalan Sultan textile centre for at least 10 -20 cents each for the simple ones. He even gives me free gifts on top of what I buy. Shopping is never that fun in department stores. Now all I need is to think of craft projects that uses the many, many buttons I have. When I was growing up, my mum used to buy Macau's almond biscuits from Chinatown once a year for Chinese New Year. As a kid , I couldn't really wait for the actual day so I would painstakingly remove the scotchtape , take one or two or even three of these biscuits and then try to put back the scotchtape again. But the putting back part was done really amatuerishly and that was when I got into trouble. There was no point denying it as my finger prints would be all over the scotchtape. Years have passed and I have not seen these biscuits. So when I saw it at a Chinese inport shop in People's Park Centre today, I just had to get it. The packaging has changed somewhat over the years but the brand remains. There is nothing like food from our childhood years to evoke the memories. I love collecting tins with good designs and this one from Macau looks modern yet it manages to maintain its tradition. Others in my collection include an Italian amaretti cookie tin which features a little girl in a beautiful blue sash, a Marks and Spencer double decker cookie tin and chocolate biscuit tin and many more. Years from now, I hope they will evoke some memories for my children. Went to China Square flea market today. Haven't been there for some time and there are some new stallholders, including Ah Jing, a sweet old lady who sells her own hand made quilts and bags. A bag covered with white and fushia rosettes caught my eye even from a distance. Though Singapore is hot and humid all through the year without any seasons, the rosettes reminded me of spring. I didn't even bargain as I thought the price of $16 was actually quite cheap for something that's handmade. Some seasons back, I caught an episode of Project Runway where a contestant couldn't resist putting rosettes in all her creations. Thought she got too carried away but today, I got carried away. Mother's Day is coming up soon. Besides thinking of what I should get for my mother, I am also reminded of the same time last year when I set up a stall at the Lime flea market with my aunt. We sold little hand made mother's day hearts and it was quite an enjoyable first time experience for me. Made $70 that day but after deducting rental and cost of tables and chairs, it wasn't much. But it wasn't so much the money but the experience. I guess it's never too late to develop that entreprenial spirit. Kawaii means cute in Japanese and if you want to go kawaii on a budget, Daiso is the place. It has 4 branches in Singapore - IMM Jurong, Vivocity, Plaza Singapura and Sembawang Shopping Centre. Everything there costs Singapore $2 (US $1.30) , from snacks to household goods , from stationery to gardening tools. The range is endless. New stocks arrive in all the time and just when you think they can't go any more kawaii than that, new kawaii stuff keeps coming in. They must have a team of designers who keep a look out for trends and translate them into affordable goods by manufacturing them in bulk in China. I love miniature furniture and Daiso even has them in different ranges, from country and modern collection to zen and bamboo. Did I mention that they were $2 each ? And the Japanese table ware section is amazing. The Japanese love to collect a huge number of dishes. There are small dishes for soy sauce, long plates for fish, bowls with lids for miso soup etc. Unlike Western setting, these dishes do not have to match at all and they are made from a wide range of materials including ceramics, glass, lacquer, metal and wood. The Western section too has its charms. Glass tumblers and ceramic mugs with polka dots, flowers and geometric prints. Pie dishes and ice cream cups in the sweetest pastel colours. Very often, I find myself rationalising whether I need them and very often , I rationalised that I do. When they are so affordable, getting carried away is often the case and finding space in the home becomes an issue and not the price. Paper dolls, cute little stickers, erasers in the form of sushi, happy colourful handheld windmills, paper laterns ..........it is so difficult to resist putting them into your shopping trolley. Even came across a cross between vodoo dolls and monster dolls and I couldn't resist one with a polka dotted scary face and the other with a heart shaped froggie face. Another favourite of mine is the gift packaging section. Shelves and shelves of ribbons and plastic gift bags of the most beautiful designs. Most useful especially during the Christmas season of last minute gift wrapping. There is even a plastic section which carries many Muji types of storage, simple designs at a simple price. Yes, $2 each. If friends of mine come visiting from other countries, I always recommend them to go Daiso-ing. My favourite branch is at IMM Jurong as the floor space and the range of goods is the widest compared to the others. Stretching your budget for gifts is a lot easier here. Went on a walking trail from Kent Ridge to Hort Park. Never knew such a park existed till today. Hort Park has 20 themed gardens, ranging from garden conservatories, bamboo labyrinth, herb and spice garden to Fantasy Garden featuring characters from the Wizard of Oz . Loved the mosaic patterns of flowers and trees as well as the zen pool of reflection at the entrance. "Girls and boys, remember to ask your mummy to tell you the story of the Wizard of Ooze ". I would like to hear that story too. It is sad to see shops that have been around for some years close during these trying times. I have always enjoyed a nice cuppa of tea with a tray of scones or cakes at Eclectic Attic at Plaza Singapura while mulling over whether I should buy a piece of furniture or lamp shade. This cosy cafe is in the midst of the most charming collection of vintage furniture, teapots, cups and Peranakan ware, which are all for sale. 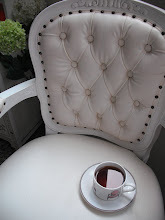 My favourite tea selection is raspberry mint tea with scones. I actually bought a vintage colonial teak cupboard at 50% off the display price while contemplating over a cup of tea. What eventually convinced me was the lovely scallop design over the glass casing. Buying something that you love but not really sure where it fits in the house can be considered quite rash but if you like something so much, I believe it will find a way and a place in the house. Of course it helps to have a patient husband who doesn't mind moving things around. Now the cupboard houses my hodge podge collection of teapots and saucers, hand made plushes and knick knacks . I have always wanted an uncluttered home environment but sometimes this contradicts my penchant for buying vintage. Eclectic Attic will be closing down soon but apparently the cafe remains on the premise under a different management. Will miss looking around the furniture but at least I still can have my cuppa of tea after a spot of shopping at Plaza Singapura. I have always enjoyed good illustrations in children's books. My favourites are those that embody a mix of innocence , curiosity and wackiness. A classic written by Gene Zion and illustrated by Margaret Bloy Graham all the way back in 1956 is Harry the Dirty Dog. My daughter Chloe loves the story and most of all its pictures. I love it for its vintage illustrations. The women in the story wore fashion of the I love Lucy era with pill box hats and wide umbrella polka dotted skirts. And yes, about the story.....It's all about a little dog named Harry who went off for a little adventure, got himself so dirty that even his family did not recognise him beneath all that dirt and soot. Of course there's a clean and happy ending. Was at the market this morning after my jog at the park and met a sweet old lady selling pineapples, turnips and pink ginger buds, ingredients to make a good Chinese rojak salad. She was a spritely 80 year old who didn't like being cooped in the house all day. So she set up a little make shift stall selling what the family plot in Johore Bahru, Malaysia grew. She even had a maid at her side to make sure she was alright. And she had a bucket too of the most lovely pink waxy flowers. Thought they were some form of heliconias but actually, they were pink ginger torch flowers, full bloom versions of the pink ginger buds. I am surprised that I've not come across it before in all its full glory. It could be because most of them have been nipped in the bud before they actually bloom. Slivers or fine cuts of pink ginger buds give many Asian dishes added flavour and food such as Penang laksa and Chinese rojak would not have its special aroma without them. It gives dishes a tangy , citrus taste. They are best used fresh as high heat destroys their flavour. As a girl, I used to play at my mum's dressing table (when she was not around of course). I can still remember how fascinated I was with her clip-on earrings and necklaces. Occasionally, I would try on her lipsticks and she did have quite a wide range then from Mary Quant, a very popular brand way back. And when I saw this picture at a flea market in New York, it reminded me of those moments, however silly they were. Strange that I grew up without ever liking make up. Supposed I had more fun trying it when I was a girl. The fact that my mum could come back any moment made it all a little more exciting. When I found the picture, it was encased in a battered and broken frame but I found the little girl's expression, while looking at the mirror with her freshly glossed on lipstick , funny in a silly way. She had a little accomplice at her side too, a cute adorable white dog. The fine print below the picture says 1958. I knew I had to buy it and it costs me only US$3. Now it sits prettily on my shelf, an "old treasure" in a brand new frame. I have a sweet tooth and always do a double take at interesting showcases of pastries and cakes. In New York, I love the Balthazar French bistro which has an interesting bakery offering croissants, baguettes and brioches. Also snapped a picture of another interesting bakery called EuroPan while rushing to take the subway 2 years back. Never got to go in but I at least I did pause to gawk, even if it is for a while. The cakes and pastries in New York Times Square however have no finess. Just huge, huge portions, laden with equally huge portions of cream. I have never been so turned off by sweet offerings. In Singapore, macaroons seem to be a hot items now. The Canele Patisserie in Singapore has a beautiful display of macaroons in all its varied colours in its showcase. 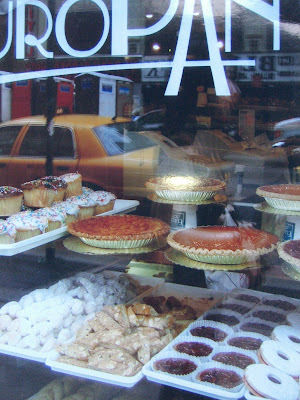 It is nice to see bakeries window dress. The new Sembawang shopping centre has gone through a revamp. There's an interesting bakery there now. Took a picture while on the move. Must find time to go back one day to savour a cuppa and some macaroons.